1. The US Fed hiked, as expected, for the third time in 2017. And the Fed’s latest dot plot shows three more hikes are likely in 2018. But Janet Yellen’s last call as chair couldn’t save the US dollar, which was lower this morning. Overall, it was a mixed night for global stocks, but ASX200 futures traders are bullish with fingers crossed for a break higher than the November 6 high of 6,060. In data, it’s jobs day, with some key pointers to wage growth. Here’s your 10-second guide to that drop at 11.30am AEDT. 2. Reading books. Mark Zuckerberg does it. Bill Gates does it. Up to 50 times a year, reportedly. But you’ll probably only have time for one book over summer, so don’t waste it and take their word on what’s good. Here are their 17 top picks right now. 3. Four days after futures trading opened on bitcoin, it’s had its first freeze. The cryptocurrency slumped below $US16,000 overnight, and that volatility caused futures contracts to temporarily cease trading on Cboe Global Markets’ exchange. Elsewhere, Ripple’s value soared by 49% to send it past litecoin as the fourth largest cryptocurrency by market cap. Even while litecoin was having a record week. 4. If you did buy bitcoin, you’re in a bit of a quandary right now. Because, when do you sell? “I would never advise anyone to sell all of their bitcoin,” one expert told us. But others said maybe you should shift a bit today, especially if you need the cash. US Fed chair Janet Yellen used her final conference on rate moves to comment on BTC, and called it a “highly speculative asset”. 5. Have you sat on the sideline and watched everyone else make pots of cash? It’s not just bitcoin soaring – US stocks have had a stellar year, so it’s easy to see how being afraid to spend money could actually cost you money. Here are four other financial choices that could haunt your money for life. 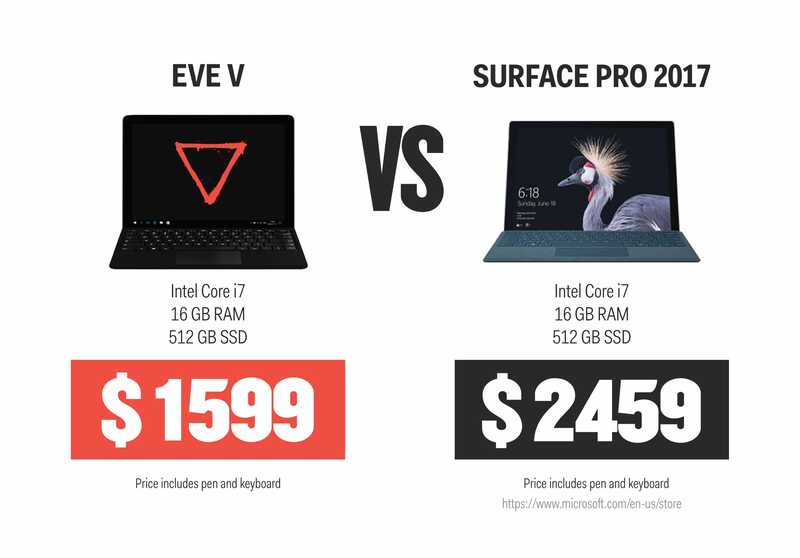 The Eve V, on the left, is pretty much a powered up Surface Pro (right). But its design was totally crowdsourced with input from more than a thousand people on what they want from a hybrid laptop. Yes, it’s a lot cheaper, but we got our hands on one a couple of weeks ago and can say that it’s also very, very good. And in a highly unusual move, the US Justice Department invited reporters to view text messages from investigators on special counsel Robert Mueller’s team, which were critical of Trump. But the US President scored the biggest win of the day when Republican leaders agreed on their final tax bill, which could see the federal tax code overhauled by Christmas. 8. Here’s a new strategy on how to handle North Korea – just wait for it to collapse. US secretary of state Rex Tillerson admitted that was one possibility, but it didn’t mean everyone could relax. The White House has a contingency plan in place to make sure that if Kim Jong Un’s regime does crumble, all the nukes will be looked after by the US properly. 9. Do you love your new “smart” luggage? Qantas and Virgin don’t. They’re following the US lead of allowing luggage that can charge your phone, tell you where it is and motor you through an airport only if the lithium battery can be removed and stored in carry-on baggage. 10. City people pretending they liked the taste of kale felt pretty much like the beginning of the end of days. But here’s proof humans can still turn it all around at the last minute – iceberg lettuce is making the comeback it deserves.